just wanted to post a pic of my table set up. last night was a huge success already. it was jammed packed in there. into everyone. but, it was good. it’s nice to see all the support for local artists. so, thanks to all who purchased jewelry from me already. see post below for address etc. Save some cute necklaces for me! I won’t be able to make it down to P-town until tomorrow. Great kick off last night! Your table looked fab. You have such beautiful jewelry. Fun to see you last night too. I love my little flowers I got from you and i am wearing them right now. Good luck the rest of the bazaar. Best of luck! I hope you sell everything! The Beehive Bazaar sounds so fun. Sounds like Provo is getting with it. I think you and I would be great friends if we were to meet. I just discovered your blog today and I love the boy’s circus birthday. I’ve been featuring bday ideas on my blog all week. I’d love to feature your lovely blog on mine. Thanks so much. I love the frames. Very clever. I sure wish I could be there (VA is a little too far away though)! I love your stuff. I often don’t buy jewelry since I can make it myself, but I just love how you put things together. I should just break down and buy something! I’m glad you’ll be putting more stuff in your Etsy shop soon. 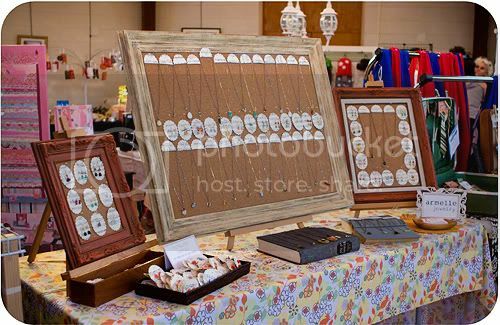 So glad to see that your jewelry was at the Beehive Bazaar – definitely some of my favorite pieces!